I didn’t get good before and during photos for this project but this was another Asian piece we had. It’s not a great quality piece but I use it for storage. I fought with this from the start. 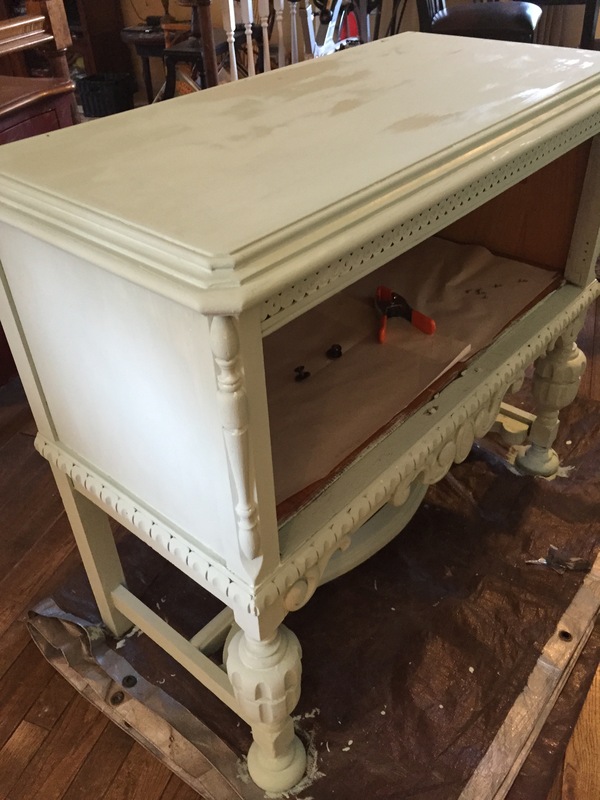 I tried black semi-gloss on the body and green chalk paint on the drawers and I hated it. 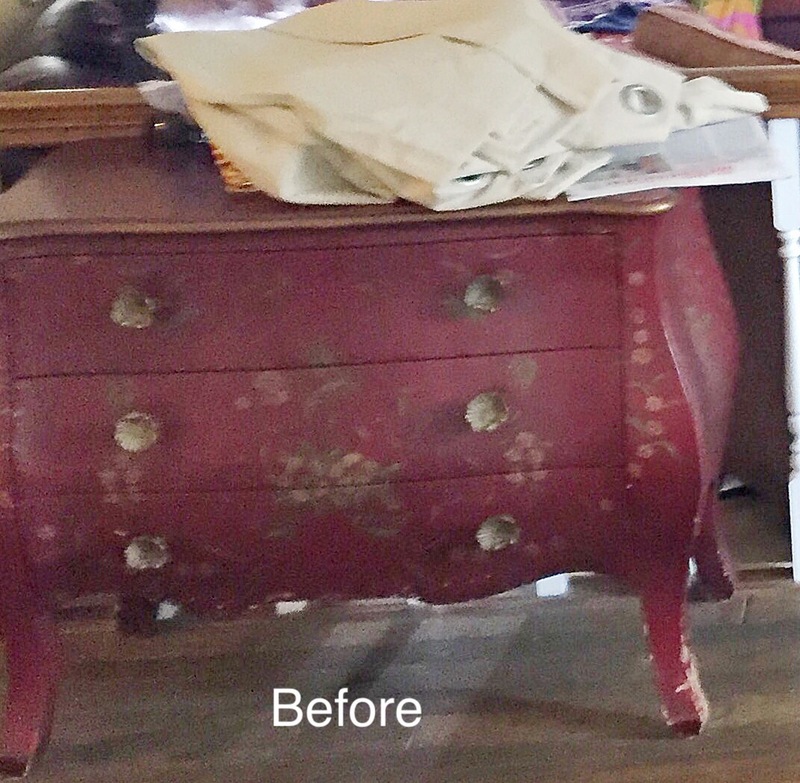 So I finally ended with chalk paint all over and I distressed it to reveal the black paint and I didn’t distress the drawers. I accidently Used a coat of crackle paint on top as I mistook the jar for varnish. I’ll read better next time. I sanded that coat lightly and covered it w two coats of varnish – you can see a little crackle up close but barely. I added new knobs and I like it the after much better than the before! 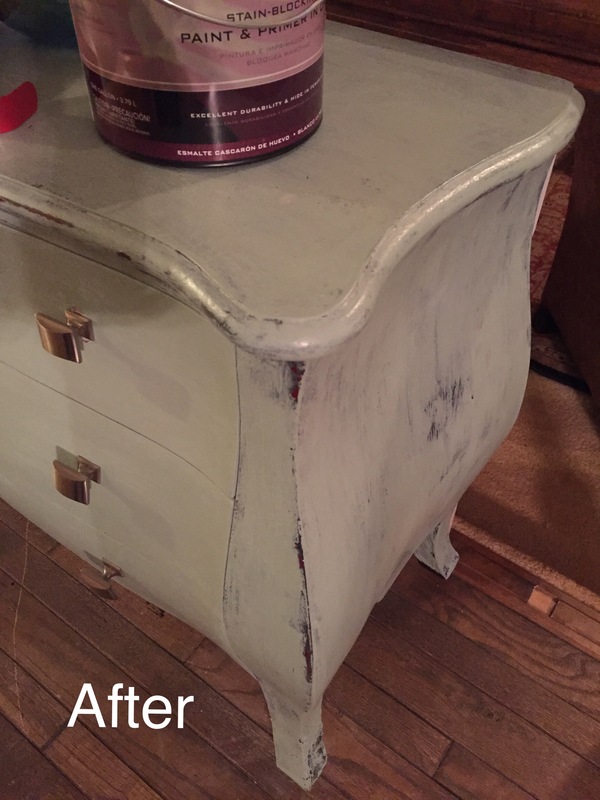 –You can see the cans of paint on top of the piece in the after pics. 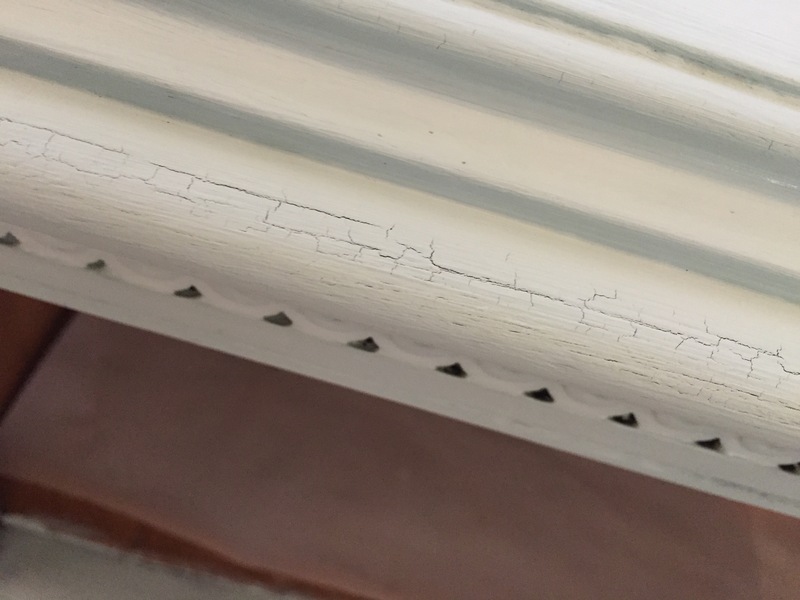 I’m onto painting the walls – they are in need of freshening! I can’t wait to write these words. I’ve been hoping to announce this well before now but I had to wait for it to happen but now I can tell you- I Have my own studio!! Ok it’s only my garage but it’s a place for me to do my thing -whatever it may be. It’s my creative place. It took a very long time to get a studio. 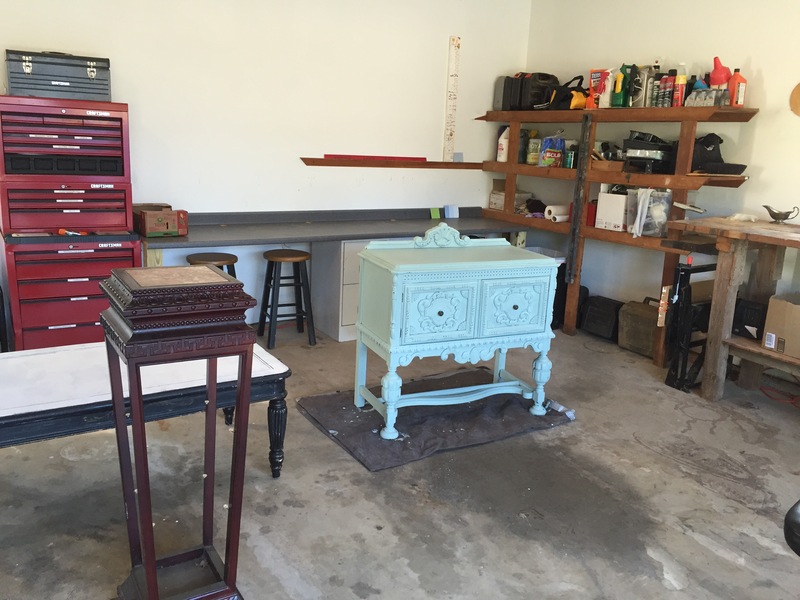 Partly because I never considered using the garage for my creative space until I began to paint furniture. Also the garage was a sty. There is no nice way to put it. It was a huge mess. I couldn’t walk across the length of it to get to the extra refrigerator so I would send a teen in for me hoping they came back in one piece. We had made many attempts in the past to move crap around and to reorganize it but it would end up collecting more and more stuff. 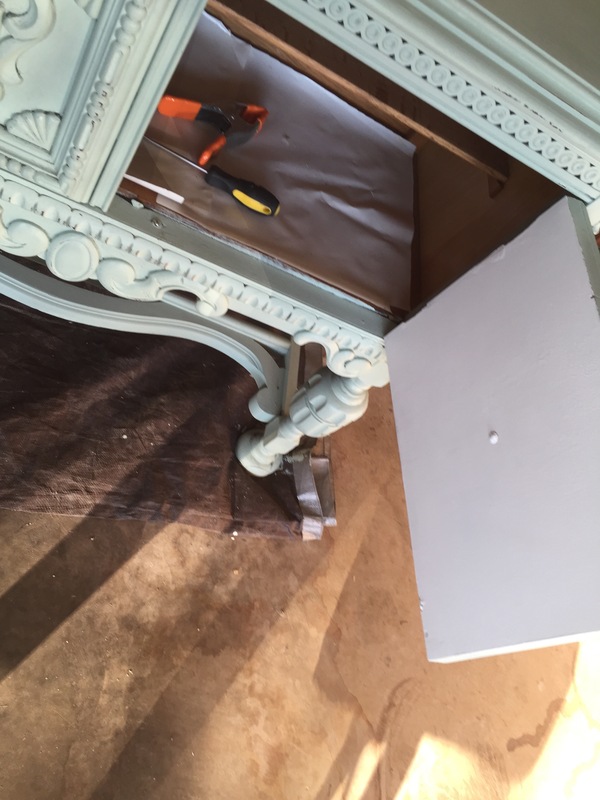 But last week after I had mentioned twice that I might like that space to house my newest creative endeavor of painting furniture the ball got rolling. I heard the garage open. The teens were summoned to commence removal of crap. There were two trips to the dump with our trailer filled with stuff. Kevin only asked me once or twice what id like to keep -there wasn’t much I really wanted and I’m sure he thought I might slow down the process with my considering what to keep and what to toss if he kept asking. Some things went to the dump , some to the shed in our paddock, and some down to the basement storage -another scary black hole that we need to sort through this winter. I bit my tongue when I realized some items made there way back indoors – I didn’t even ask what they were. I realized I best shut my mouth because what was happening in the garage was a miracle in the making I know when to just let things go-sometimes! After two days (yes two) the garage was empty. Then I heard hammering and sawing. 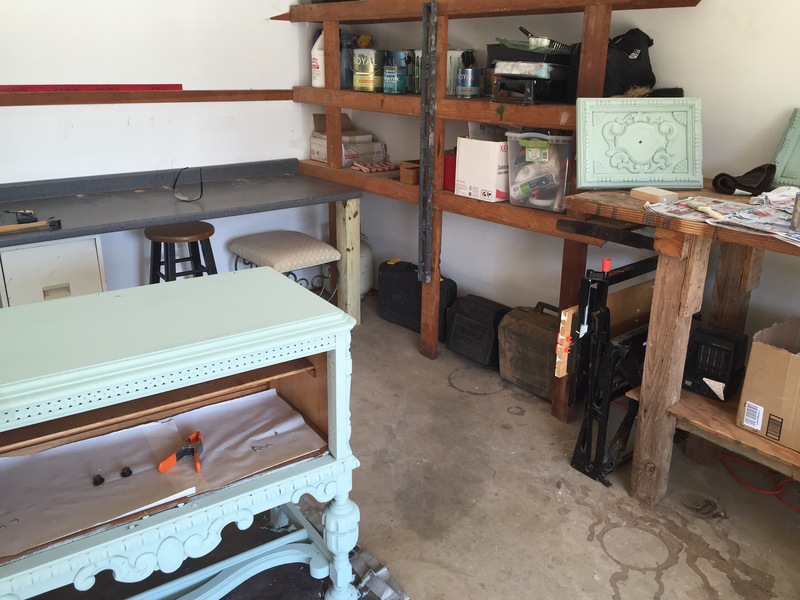 I peaked in and legs were being made for my salvaged countertop so I would have a work area. Yay! I thought to myself as I went down to feed the chickens and horses. Yay! When I came back up from the barn my space was ready. My project that I was already working on was moved in. The space was mine. I have two work tables and storage shelves. I have a fan for the hot days and am planning on some type of heater for the cold weather. I figure there will be some indoor work still in the deep of winter as paint might not dry well in the cold. But I plan on spending some time out there. Painting isn’t the only thing I hope to be doing in the studio. I am still hoping to do some glass fusing as soon as I can buy a kiln. I may use the space to matte my photos. Who knows what else might inspire me. I probably won’t write in there but if I can figure out a way to set up a decent writing space I just might. It’s peaceful out there. Nobody (except Rudy who will have a dog bed in a primo spot) really wants to hang and bug me in the garage. It’s the only space that’s truly mine in the entire house. So I’m going to claim it. Maybe Rudy will pee on it and mark our territory- ok we won’t go that far but personal space is hard to find in my home. It’s that cherished. I already have a plan to put my photos up on the walls. I gave it a shot the other day but an hour after I got all the pictures up on the wall they all fell down -I used painters tape to put them up. Not too bright. Good idea bad execution. So I’ll start again and either use my giant push pin and string idea that I used in my husbands office or I’ll think up something else. But I’ll put my stamp on it no doubt. It didn’t take me long to get working in my new workspace. 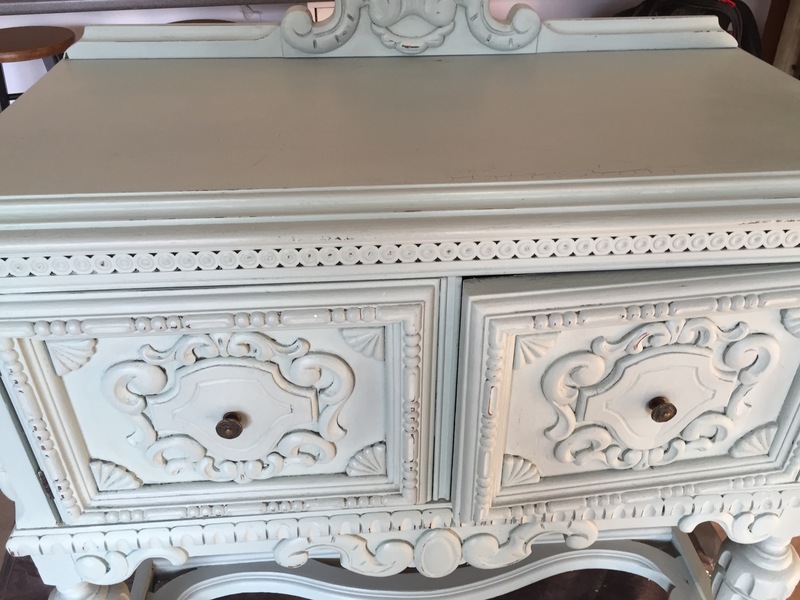 I had decided to take my Nana’s hutch (I guess it’s a small sideboard but we’ve always called it a hutch)- that was ever so old and ever so beat up- and paint it. I’ve been trying to get things brightened up in my house. The hutch sits against the wall under a window and is partially blocked by our pub height dining table. It was looking ragged and I had considered getting rid of it. There isn’t much of a market for antiques like this and frankly I’m attached to the thing. It’s one of a few pieces I got from my dad when he moved 20 years ago to Florida. The hutch was in my Nana’s dining area in her walk up apartment for as long as I could remember. 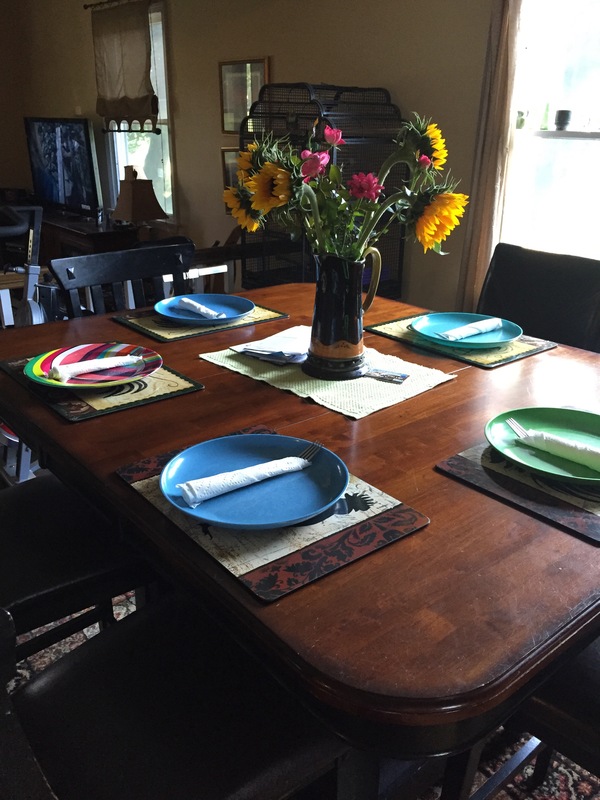 I took China out of it for her to set her table. I put the clean dishes back in. I just can’t part with it. 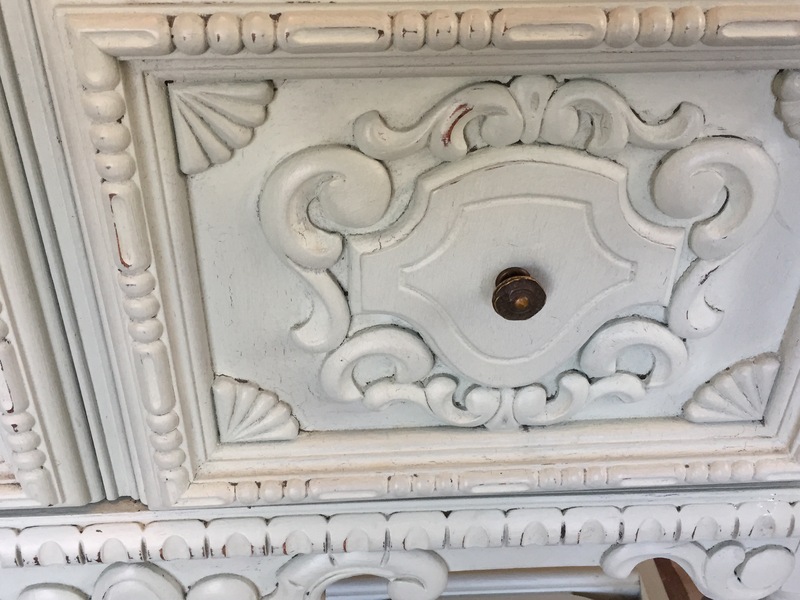 I could have had it refinished but I felt like it was calling out for paint. So I had my sander -Ozzy -give it a once over to get it ready. I wanted to leave the character (dents and scratches ) in it I like patina. 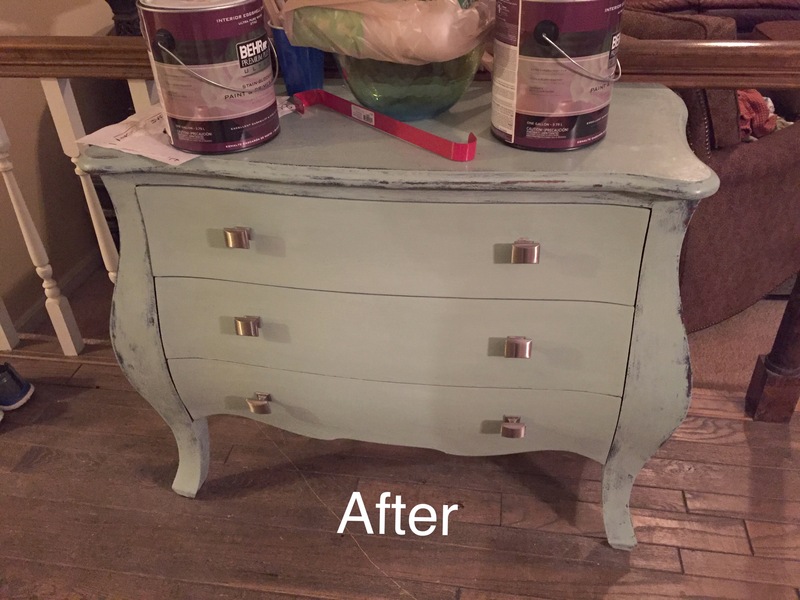 I was going to use chalk paint for the first time. 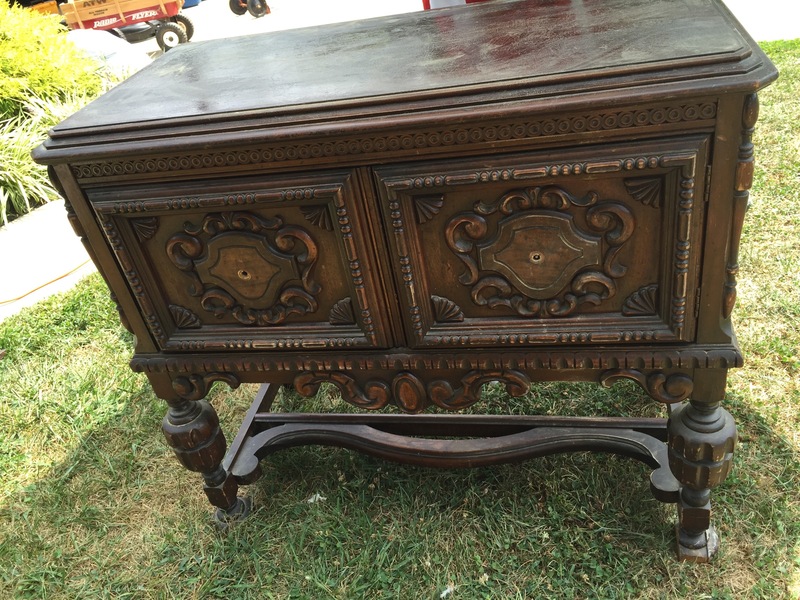 I was going into this process rather blindly but I had some quick instructions from my friends who owns a local consignment and new furniture/home decor store in my town. I also had the Internet. 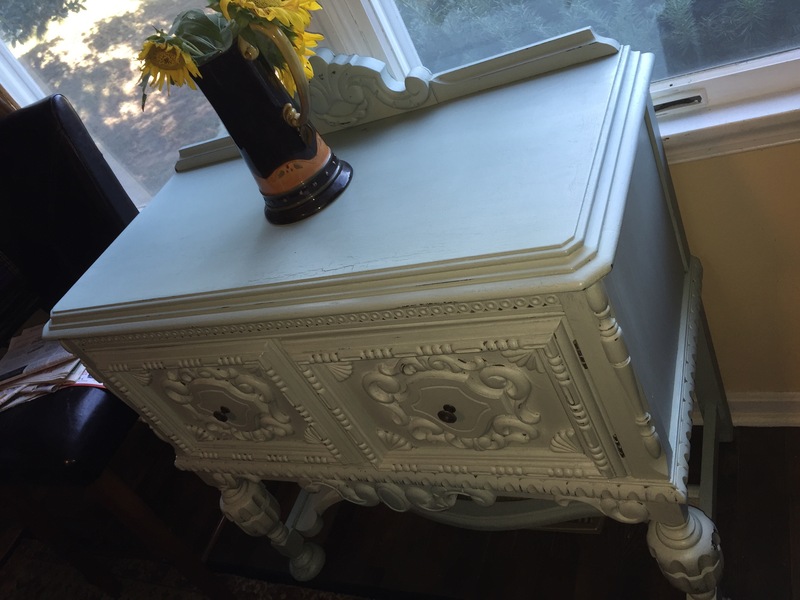 I used Maison Blanche chalk paint and their clear wax. 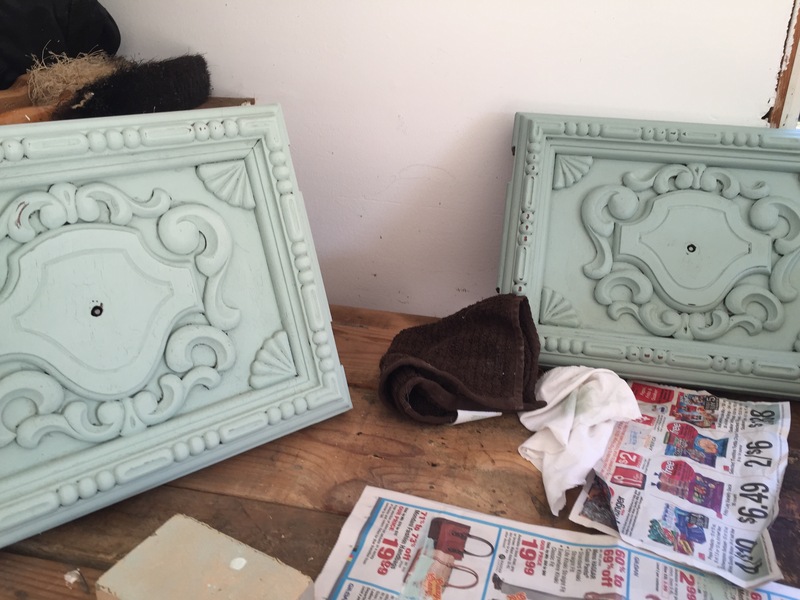 The understanding of how wax on chalk paint works became clearer as I worked on the piece. I really enjoyed the process. The end result isn’t perfect but I love the aged look it still has. 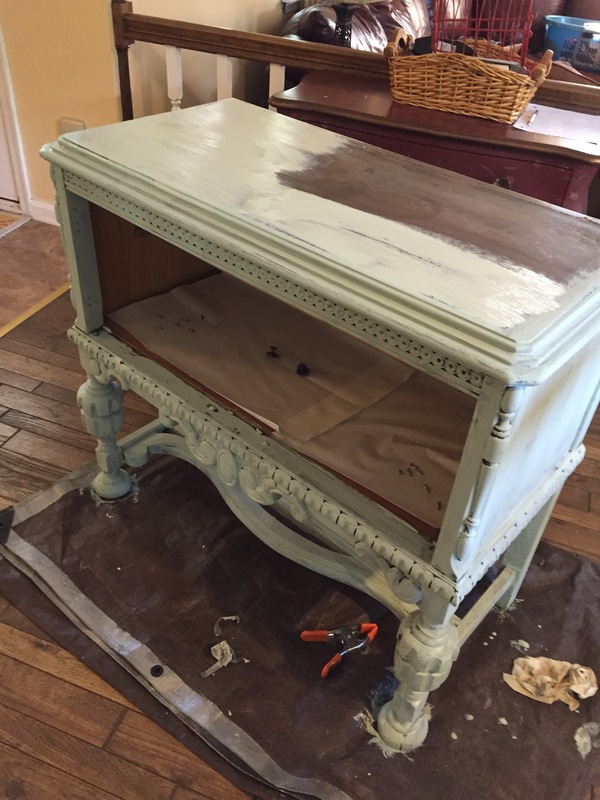 The paint did some crackling naturally and I distressed the piece some as well. I think I would have distressed it more had I understood the whole process ahead of time but it’s fine like it is and I’m told that I can go back and distress it again and add some wax to it and buff it out again. The beauty with wax is in the buffing I discovered. I used steel wool to buff (#0000). I wiped it also with a cloth. For me the wool brought up the shine faster and was easier on my bad shoulder than just using a rag. Once buffed the piece has a shine and smoothness that I couldn’t imagine before I began buffing. 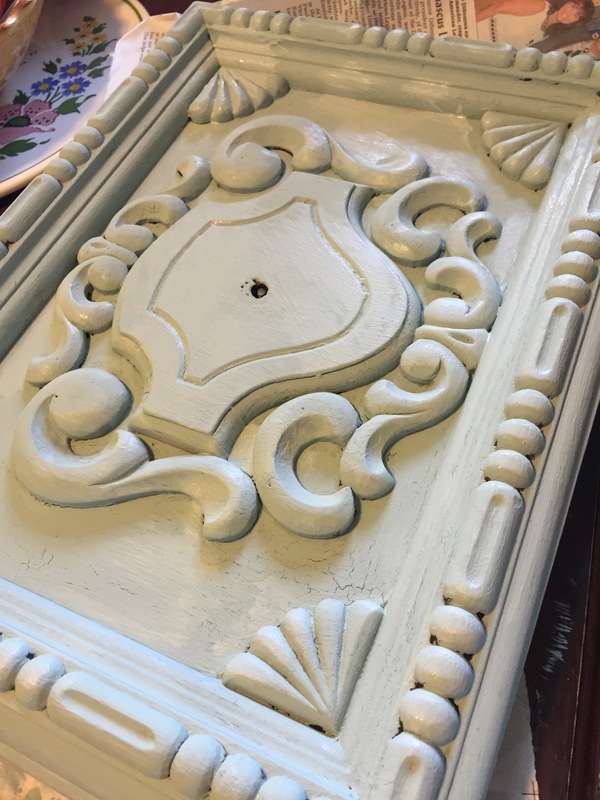 I wasn’t a fan of chalk paint until I finished the buffing – then the aha moment happened and a fan was born. I didn’t paint the inside except for the inside of the doors which are I’ve 1.5 inches thick. Who makes stuff like that anymore? I painted the inside door white and stenciled 2015 on them and signed my name. The year of the rebirth of the piece. I had had visions of painting the inside entirely. I thought some fun color and then some pretty contact paper for the shelves would really be awesome But I bailed on the idea when I realized that the smell that reminds me of my nana when I open those doors might be gone if i changed the inside too much. I swear it still smells of her apartment from 1987. It just takes me back. It’s a comfort. Even at 51 I miss her. The hutch now sits back inside my dining area -it looks so great. Like new but with the history that I know. I’ve become so into reusing, updating and repurposing things. 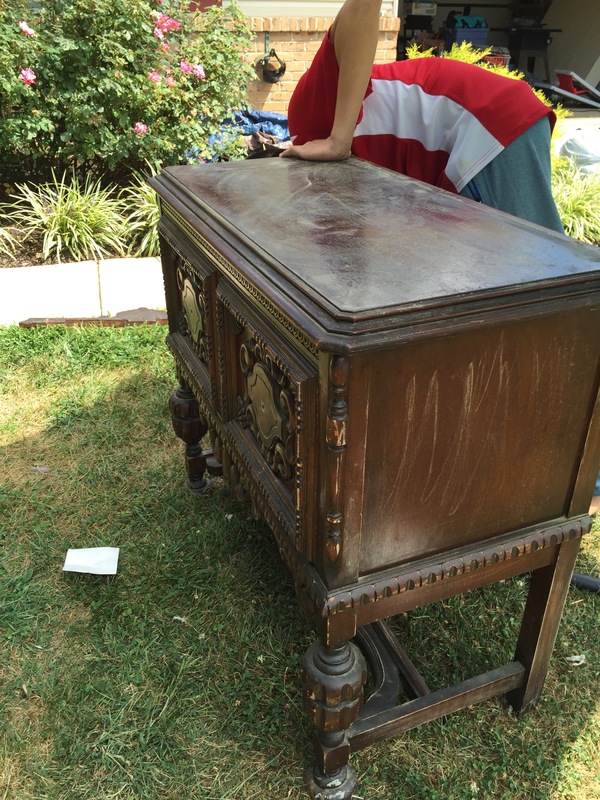 I already have two old pieces of furniture from our house in my workspace that hope to paint and maybe sell. But up next is my dining room table top and the wall cabinet and shelves (probably a real hutch ). I’m on a quest to bring in more light. The wheels are turning in my brain at the prospect of all that I can create In my studio. It’s just a space in the garage and I’m told I may have to share it with a car if we are to get a large snow storm (we’ll see about that) but it’s so much more to me. It’s solace, it’s inspiring and it’s mine. 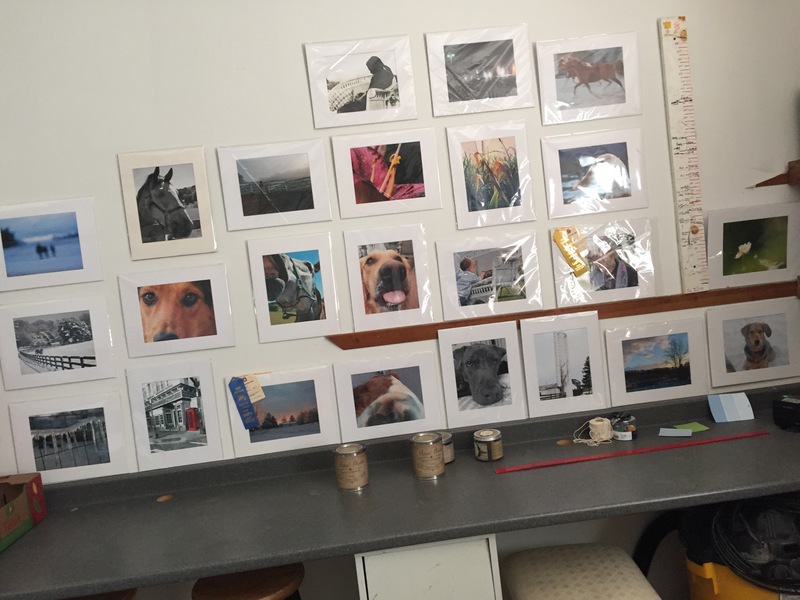 These photos all fell down! I used blue paint tape. I will put up again with a better execution. My studio! Some new projects waiting fpr rebirth. Last week you could not see into the garage! My next project. Dining table top. Crackle just happened- I like it. I painted the inner doors white. All finished in the studio…the hutch looks greener here than it is.